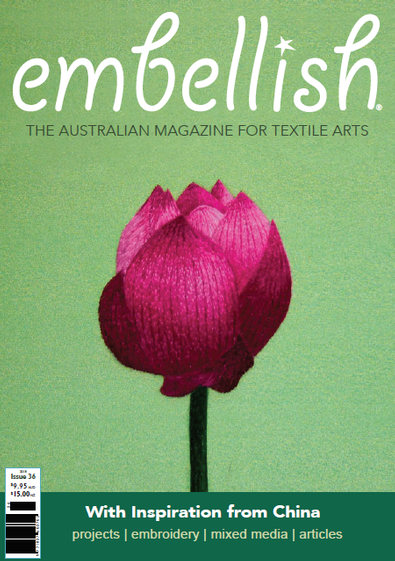 Embellish magazine aims to fuse fashion, fantasy and art into everyday items, gifts and homewares. You will find in each issue a mix of techniques and articles as well as ideas and inspirational stories. Expect to see a range of projects including dye processes; fabric manipulation; knit and/or crochet embellished finishes; couture techniques; hand embellishing; machine embellishing; prints; custom designs; repurposed textiles and projects related to textile applications that incorporate fabric, yarn, felt and/or fibre. Every item you embellish has the possibility to become unique; every gift you give carries your time, love and feelings. The possibilities are endless, but with our help, you'll be going in the right direction.